Setting aside the biting wind and driving rain there are other signs of the onset of winter. The root vegetables are starting to come into their own as winter warmers. With soups and casseroles starting to be the order of the day we are well stocked with parsnips, turnips, carrots and celery to give us that truly green living feeling as we hunker down. The leeks are romping away now and swedes and onions I planted a few weeks ago are also starting to show promise. 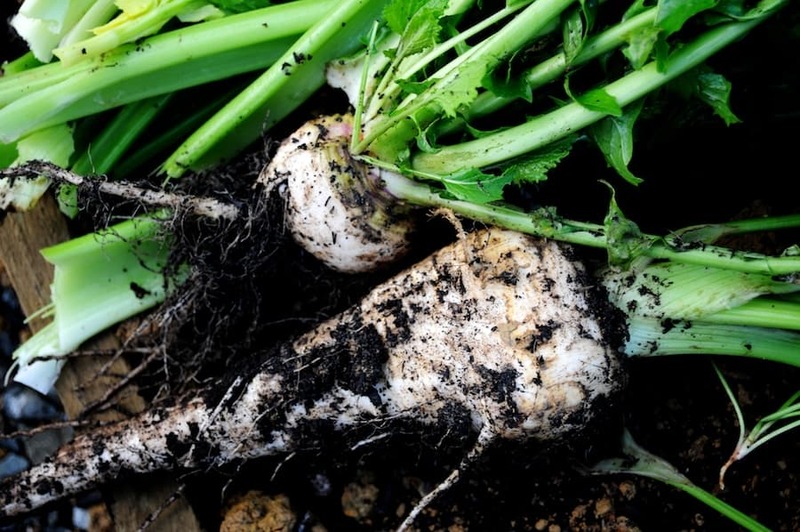 The celeriac is my prized winter veg and there are signs of that knobbly delight surfacing from below the ground. We enjoyed a really tasty lamb and squash curry this week which inspired me to branch out with my squash cooking. What’s most surprising though is that I’m still picking tomatoes which are being oven roasted to bring out the best of their flavour before stashing in the freezer for our much loved work night catering of pasta. It just goes to show that whatever the season living from the kitchen garden continues to be fun. So much more rewarding than the supermarket swoop. Wow, how truly wonderful to be enjoying your hard worked for bounty and tucking in as the winter rolls in. Bon appetite!